Dr. John Byron, professor of New Testament at Ashland Theological Seminary, will present a lecture titled “Fakes, Forgeries and Frauds: Does Archaeology Prove the Bible?” on Thursday, Jan. 31, at 7 p.m. in the Smetzer Auditorium inside the Gerber Academic Building on the Ashland Theological Seminary campus. In this lecture Byron will explain why many experts are skeptical of these claims and will provide an overview of what archaeology can and cannot tell people about the Bible. He also will highlight some authentic discoveries that have contributed to everyone’s knowledge of the Bible. The evening lecture, which is free and open to the public, will be followed by a light reception and an opportunity to tour the Seminary’s Bible Museum. For more information on the event, contact Amy Burns at 419-289-5462. If you are interested in attending please let us know by registering here. Readers of this blog will know that I have expressed my discomfort, if not out right opposition, to the way we talk about homosexuality in this nation. I have warned of the unintended results of talking about "biblical marriage" and I have asked when will the church have a conversation about homosexuality. Both of those previous posts came to mind as I watched the below video. It is an Op-Ed from the New York Time by Roger Ross Williams. In the piece Williams explores the connection between American Evangelicals and churches in Uganda. While Williams praises the American churches for providing some much needed services in Uganda, he also criticizes them for the way that they are impacting the debate on homosexuality in Uganda. Williams outlines connections between American Evangelicals and ministers and politicians in Uganda who are using the debate over homosexuality to marginalize gays and lesbians in Uganda to the point that not only is there an attempt to make it an illegal, but even to enforce the death penalty against homosexuals. The death penalty clause seems to have been dropped for now, but one can't help but wonder if it will surface again later should the law pass. No matter on which side of the debate one stands, I am not convinced that many would truly want to see the death penalty used against homosexuals (though a minority certainly would be in favor). I am also not convinced the many evangelicals would want to see homosexuality made a crime in the USA. They may have theological objections to the practice, but they aren't ready to enact legislation to outlaw it. Many of them, I suspect, have family and/or friends who are gay and while they may disagree with them, they are not in favor of throwing them into jail. This seems to be one more example of unintended results of applying the Bible. Here is the video. I am sure that some level of editing has been involved and, like every story, it would be interesting to hear more than just sound bites from both sides. But the basic outline of the story should raise our conscious as to what it is American money, through various missions organizations, is promoting in Uganda. One thing every student learns when studying the book of Acts is that the author didn't intend for it to be a blow-by-blow account of the early church. At times events are overlooked, rearranged and perhaps even presented with a particular agenda. When I introduce some case studies on how the author of Acts used history to write Acts, they begin to realize that the ancients wrote, understood and used history very differently than we do. At the same time, there is little doubt that there is a strong historical core supporting the book's outline. Craig Keener has just published his first installment of what will be a four volume set Acts: An Exegetical Commentary (Baker Academic, 2012). Asbury seminary has posted an interview with Keener in which he explains why he argues for the essential historicity of Acts. It is a good overview on how the ancients used and wrote history. 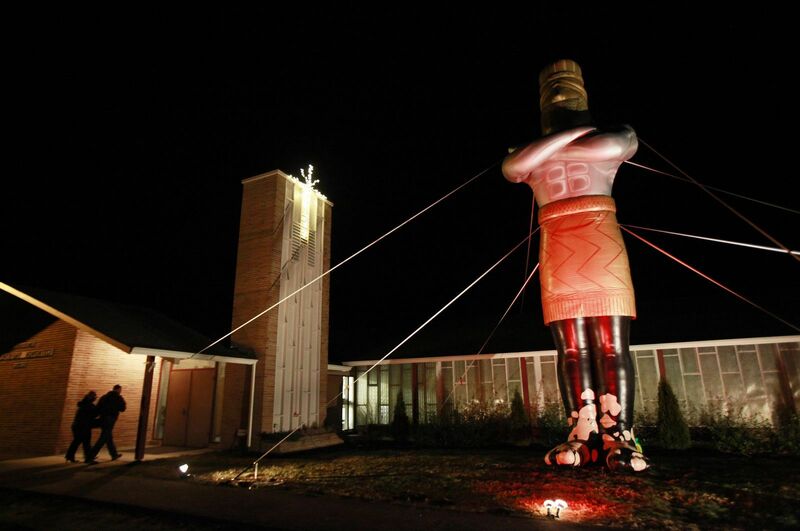 A 30-foot inflatable figure stands outside the Church. Members of the congregation call him, “Nebe,"
Filed under: You can't make this stuff up. It's not unusual for churches to include statues in the church sanctuary or as part of the landscape. The statues are usually of Jesus or one of the saints. Sometimes they reenact a scene from the Bible. Sometimes the statues are so big that they lead to distraction was with the fifty foot Jesus at the Rock Solid Church in Monroe, Ohio. But I have never heard of a church setting up a statue from the apocalyptic dreams of Nebuchadnezzar. But that is just what a church in Standwood, Washington has done. 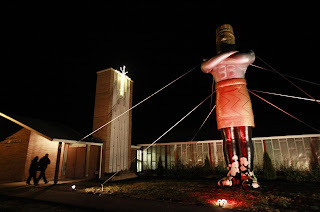 In the front garden of the church on Cedarhome Road, church members set up a 30-foot inflatable metallic man, a character in King Nebuchadnezzar's dream recounted in the Old Testament book of Daniel. Held down by guide wires, the figure stands in a spotlight that makes it visible even during dark January nights. "It's an attention getter, that's for sure," said Greg Howell, who serves as pastor of the church. The statue is being used to promote the upcoming lectures given by an expert in end times prophecy. The goal of the statue is to generate interest in the metallic man and what the Bible has to say about the end times. While I doubt that the featured speaker and I would agree on too many areas when it comes to "end times prophecy," I do give the planning committee full points for the most creative gimmick to date. I haven’t posted on Thessalonians since before Christmas, but I am filling in some holes in my commentary and decided to share some thoughts from 1 Thessalonians 3:1-5. 1 So when we could stand it no longer, we thought it best to be left by ourselves in Athens. 2 We sent Timothy, who is our brother and co-worker in God’s service in spreading the gospel of Christ, to strengthen and encourage you in your faith, 3 so that no one would be unsettled by these trials. For you know quite well that we are destined for them. 4 In fact, when we were with you, we kept telling you that we would be persecuted. And it turned out that way, as you well know. 5 For this reason, when I could stand it no longer, I sent to find out about your faith. I was afraid that in some way the tempter had tempted you and that our labors might have been in vain. We live in a world in which our anxiety levels increase almost annually. In addition to the constant onslaught of anxiety inducing news that we get via television, the internet and other media sources there is daily life. We feel anxious about our marriages, our children, our jobs. The economy and the stock market fluctuates like a ship tossed at sea and sometimes we aren’t sure how or if we are going to make it. For Christians there can be a level of guilt associated with this anxiety. We read the words of Paul in Phil 4:6 “Do not be anxious about anything, but in every situation, by prayer and petition, with thanksgiving, present your requests to God,” but on a practical level our experience teaches us that this is not always the easiest thing to do. The good news is we are not alone. The story of Israel demonstrates that anxiety is not an unusual part of life. Sincere concern for our situation and of those around us is not something that God condemns (1 Sam 9:5; 10:2; 2 Kings 4:8-13). Many times we read stories about and the prayers of people who were anxious about what was or what might happen to them, and they express that anxiety to God (1 Sam 1:16; Ps 6; 38:8; 55:4). At times anxiety exists due to the presence of sin (Ps 38:18), but that same anxiety can also lead to repentance (Ps 51). One thing that is consistent through this story is that those who trust in the Lord will see their anxiety relieved (Ps 127:1-2; Jer 17:7-8; Matt 6:25-34; Luke 12:22-31). Yet, there is a tension here. While on the one hand anxiety is a natural part of life for which we must put our trust in God, there is also the realization that not all anxiety will be eliminated in this life. There is an eschatological element to this trust in the way that the Bible recognizes that it is only with the return of Jesus that all will be made right (2 Cor 12:1-10; Phil 4:11-13; Heb 13:5; 1 Peter 5:7). In 3:1-5 Paul plays the part of the worried, hand-wringing parent anxious for news from a child. In 2:18 Paul says that he and the other apostles didn't just share the gospel with the Thessalonians, but also their lives as well. In 3:1-5 we see the evidence for this in the way Paul frets over the church to the point that it seems to be so distracting to him that he takes matters into his own hands. Unable to return himself, he sends Timothy back to Thessalonica discover what is happening there. Present, barley below the surface, is both Paul’s anxiety that everything the apostles did may come to naught (3:1, 5), and the realization that ultimately only God will be able to accomplish the work at the time Jesus returns (2:19). Paul is clearly an anxious pastor. In fact, for Paul, anxiety over the church is with him daily. In 2 Cor 11:28 he notes that in addition to the various trials he suffers as an apostle he faces “daily the pressure of my concern for all the churches.” The word translated by the NIV as “concern” is merimna which can also be translated “anxiety,” “worry,” or “care.” It is a rarely used word in the New Testament, but its meaning is fairly consistent. It describes the type of anxiety that can weigh a person down to the point of feeling like everything else in life is being choked out. Although he doesn't use that word here in 2:17-3:5, Paul is exhibiting that type of anxiety over the Thessalonians. In 3:1 it appears that Paul’s concern for the church was beginning to “bubble up” and interfere with other things. His emotions and anxiety were getting the better of him and he finally had to do something to find out what was going on in Thessalonica. Anxiety is more and more a part of the modern age and leaders/pastors are not immune to it. There is fear of failure, that you're not gifted, the lack of people and finances, of conflict, of not being respected and appreciated, of the unexpected and that you won't be wanted or needed anymore. Compounding all of this is the fear that a pastor who admits to struggling with anxiety may be perceived as lacking faith and may lose credibility with parishioners. The first thing to keep in mind is that this is not new. Paul was not the first nor is he the last to be anxious over his ministry, and he had several churches on his mind. Just as we don’t want to let the cares of the world choke out the things of God, we also don’t want the cares of the church to choke us. As we ponder this passage, especially from the perspective of leadership, there are two ways that we can apply it. On the one hand, pastors need to be invested in the church they are leading to the point that the church is always on their mind. A church that has a disconnected pastor is not going to grow spiritually. I talked to a pastor friend who has been in ministry for over 35 years and he told me that the church he pastors is always on his mind. This is natural result of embracing, loving, and shepherding a group of people. And as the church grows so will the anxiety. Many times these people become your friends and your family. They are the children you baptize, marry and in some cases bury. Just as any parent might observe what a child will do with some level of anxiety, so too pastors and other spiritual leaders will look on as they watch the people they minister to struggle and grow. This gets back to what we saw above with the kind of nurturing care Paul provided the Thessalonians when he was with them. 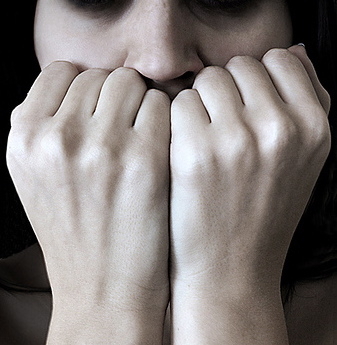 The flipside of all this, however, is the dangers related to anxiety. Statistically nine out of ten pastors will quit before retirement; 1500 pastors leave the ministry every month. There are a number of reasons for these statics, but some of it has to do with burnout. For some the burden simply becomes too much. While Paul demonstrates pastoral anxiety, we should be cautious to what degree we imitate it. We can learn from Paul, but we also don’t want to get to the point where anxiety almost chokes us. In my conversation with pastors one the thing that is emphasized is not to make anxiety the norm. This means that while there are times in ministry when stress levels rise and anxiety will creep in, it is not the way to operate continually. As leaders we are accountable to people but not responsible for them. That means that we will provide what care and attention we can, but we can’t allow the decisions they make and the things they do to adversely impact us. Like Paul, we want to do what we can to stand before Christ together with them, but ultimately it is up to them and God. Leaders need to realize that God is the only one who can ultimately complete the work. A good way to help relieve stress and anxiety is to develop a support group. From what we can see in the New Testament, Paul rarely ministered alone. He seems to have had a support group in the person of Barnabas in the early years and then Silas and Timothy later. Along with elders and/or deacons in the church a leader should decide what his or her gifts are and focus on those and then allow the Timothy and Silas’s in the church to do what they do best. One of the challenges of being able to keep up on what is going on in biblical and Theological studies is limited access to the better journals. For many years one had to either be resident near a library that carried these journals or you had to pay expensive subscription fees to have them sent to your home or office. Over the last few years access has become easier as most journals now offer an online digital version. But here again, unless you are already part of an academic institution or pay the subscription, your access is limited. Now there is some very good news from the people at JSTOR who are offering 1,200 journals for limited free viewing. All one has to do is go to the JSTOR website and register for a free account and you will be able to view three articles every two weeks. It's not unlimited access, but it is the beginning of making biblical and theological journals part of the open access movement. Some of the journals are older while others are more recent. For instance, the Journal of Biblical Literature has made everything available from 1890-2009. I hope this is the beginning of more open access to the information.